I'm now in Santiago for 4 days before heading off again for Munich where I will be giving a talk and hopefully starting some work with a couple of researchers there. The Munich group is one of the largest string theory groups in the world and so this is both exciting and somewhat daunting, but it should be a useful experience whatever happens. Anyway, I leave for Munich via Mallorca on Thursday. My return trip from Cargese was somewhat stressful due to bad planning on my part with a couchsurfer. This resulted in me having several spare hours on Saturday night with nothing to do and suprised to find that there are few 24 hour cafes in the city. Finding that all hotels were full and having all my baggage stowed at a railway station until the early hours of the morning I pleaded with a hotelier to let me sit on a seat in the lobby of his hotel for a few hours. It was only the next morning having had an hour of very cramped sleep (I didn't know it was possible to get into such a position that your stomach falls asleep, but apparently it is!) that I realised that the 20 euros I had been charged for the privelage of sitting down for a couple of hours made London's top cinemas look relatively cheap. Still, a learning experience and I (just) made it back to Santiago with minutes to spare to make the flight. 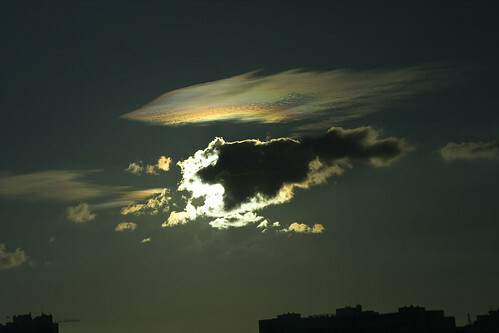 For more on iridescence, go to the always informative Atmospheric Optics site. I would really recommend having a full read of this site as having done so myself I now realise the number of spectacular phenomena around us, if only we know what to look for. This in many ways is tied into the reason I enjoy physics, the quest to understand the world around us, and in doing so take in as many riches as possible. Though my own research, which is far less close to home than atmospheric optics, may seem a distant cousin of such ideas, it is still the goal to understand the amazing things which go on around us, even if on vastly different scales.